Zika virus is transmitted to people primarily through the bite of infected Aedes aegypti mosquitoes (yellow fever mosquitoes) or Aedes albopictus mosquitoes (Asian tiger mosquitoes). These mosquitoes are not native to California. However, since 2011 they have been detected in several California counties. An Aedes mosquito can only transmit Zika virus after it bites a person who has this virus in their blood. To date there has been no local mosquito-borne transmission of Zika virus in California. 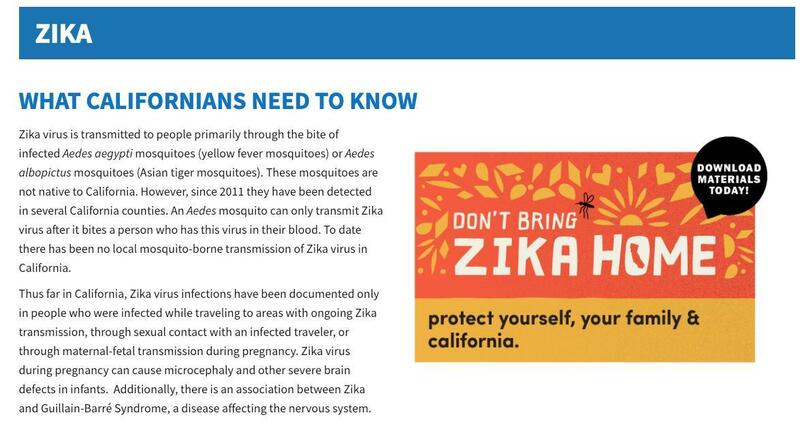 Thus far in California, Zika virus infections have been documented only in people who were infected while traveling to areas with ongoing Zika transmission, through sexual contact with an infected traveler, or through maternal-fetal transmission during pregnancy. Zika virus during pregnancy can cause microcephaly and other severe brain defects in infants. Additionally, there is an association between Zika and Guillain-Barré Syndrome, a disease affecting the nervous system.